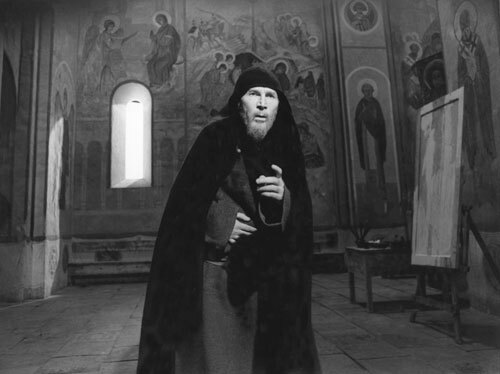 It’s hard to do any research on this movie without trying to get past the hordes of web reviewers and amateur cinephiles calling Andrei Rublev “the Greatest Movie Ever Made.” The movie is about the little known 15th century Post-Renaissance Russian iconographer, cinematically told in episodic “chapters.” Whatever else is said about it, this much, as far as I can ascertain, is certain: the movie is Russian, the movie is old, it’s in black and white, and (thus?) the movie is bound to make you think. Which makes you wonder: where have all those really ponderous and ruminative thinkers gone? What was the last work that had the scope of emotion, depth, and intellectual weight of those by Pushkin, Doestoyevsky, or Tolstoy? Really, who do we have in the 20th century that matches those guys? If today we have gorillas, back then they had King Kongs. In 2004, when Jacques Derrida died, some noted that it might have been more than just the passing of an insecure French philosopher. In fact, maybe the idea of theory itself had just died. After a grueling century of artistic and political manifestos that have invariably caused mass-scale suffering, and, most recently, the impotence of ideas and information to avoid the current situation in Iraq, has our contemporary culture lost its faith in theory to explain anything? About the term “deconstruction,” Emily Eakins in 2004 wrote, “Today, the term has become a more or less meaningless artifact of popular culture, more likely to turn up in a description of an untailored suit in the pages of Vogue than in a graduate seminar on James Joyce.” But, boy-oh-boy, I would love a deconstructed suit. Particularly one by Muccia Prada. She is infallible. Maybe right now, after a period of intellectual, artistic, and scientific process unparalled since the Classical period or the Renaissance, we are entering a new Medieval Age: an age where our own intellectual abilities no longer inspire, but, instead, frighten. The Holocaust proved that genocide was possible in a “First World” civilization, and nuclear weapons don’t seem like they’re going to be forgotten anytime soon (Iran, South Korea). Theodor Adorno wrote that after Auschwitz, poetry is no longer possible, and Al-Qaeda has impressed upon us, along with Bush’s politics of fear, that a bottle of liquid and nail clippers can apparently send a Boeing 747 with hundreds of passengers down in flames. Where’s our technology now? The Medieval Ages, you may remember, was that great expanse of about 1000 years between when those barbaric Asians (my ancestors, thank you very much) sacked Rome and thus ended the Classical period, giving rise to an art and architecture that seemed to be based in fear and suffering, until Brunelleschi figured out single-point perspective in Florence and re-birthed the glory of intellectual pursuits. Really, what good is technology when a guy who looks like me can ride by on his horse and put poison in your precious aquaducts? So here we are, then. At the cusp of the Neo-Medieval Ages, c. 2001 – ? This entry was posted on Sunday, December 28th, 2008 at 3:14 am and is filed under film architecture, theory. You can follow any responses to this entry through the RSS 2.0 feed. You can leave a response, or trackback from your own site.